One of the things you realise while travelling is how much you take your home city for granted. Foreign cities are so full of wonder and mystery, so much more than the place you spend the majority of your everyday life. But deep down you know that’s not true; you simply view your city as a methodical, standard area where you conduct yourself in the same way at all times. Well, that’s how I look at Brisbane anyway, but I’m a true creature of habit. Time to change that, and try to take a look at my city through the eyes of a tourist – one that’s very interested in beer. I should note from the start that when referring to Brisbane here, I’m talking abut the CBD. I’m assuming that this is where most tourists would start their adventure since all train lines lead to Central Station. So I started here as well, and one of the grandfathers of the Brisbane beer scene, the Grand Central Hotel Platform Bar. …it was shut, on a Saturday at midday. Ok, maybe another time then. So my first real stop was the Embassy beer bar, one of the newer kids on the Brisbane beer scene. I’d heard a bit about this place, and was really keen to see how it had evolved from the dirty pit of debauchery that I frequented when I was 18. Thankfully, Embassy has matured in the same way I have – into a classy beer geek. The range of beers isn’t as ridiculously monstrous as some venues, but it has everything you could need both on tap and in the fridges. I had a Holgate/Nogne O ‘Half A World Away’ Imperial Red Ale – that should be a clear indication that they’re not playing games. The food was also a stand out – we had a Steak Sandwich and some sliders, both recommended by the friendly bartender. 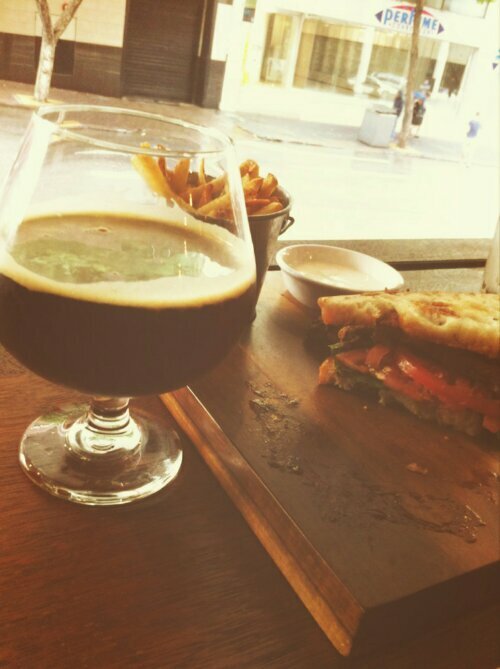 The menu is full of quality American style pub grub, perfect when you’re sampling some brews. But it was the service that really blew me away; there was one bartender working, and he made us feel right at home from the start. He knew his stuff, and was able to quickly identify me as a beer geek and treat me as such. It proves that a simple hand shake can give birth to a regular customer. Next stop was the Pig n Whistle Riverside. This was my major destination for the day thanks to one special beer they had on tap; the Fortitude Brewing Golden Ale. Fortitude Brewing is the slightly less insane venture from the boys that bring you the Noisy Minor range. I’d tragically missed the first pour the week before, so I was keen to try some. The wait was worth it – this beer is everything I want from a golden ale. Most golden ales i’ve tried are pretty lackluster, but this! It has more flavor in it than many mainstream pale ales, while still managing to keep everything fresh and light. The bitterness is much bigger than expected, riding over the top of the biscuity malt and fruity hops. As such, I’m thinking this beer may still be a bit too ‘big’ for the average punter. But beer nerds are going to go crazy for the stuff. The only issue I had involved the weather – it was raining, and this is really a beer that you want to enjoy with the sun shinning on your shoulders. Bring on summer. That wasn’t the end of my session, but it was the end of my note taking for the day – I met up with some mates and got pretty merry. I’ll have to recount the afternoon session another day, because there are a few more crafty gems hidden in the CBD. But an important point was made – no longer do Brisbanites have to travel to those harder to reach suburbs to find quality beer. The CBD is growing in options, and hopefully bringing the craftier side of beer to the attention of the regular public. Another terrific article mate, I really enjoy your blog. Yep as a Brit living in the city I’ve seen a tremendous change in the last 2 years in the craft beer bar scene here in Briz. Just thinking that when I arrived here in 2011 that the Archive & the Brewhouse was our lot seems unimaginable now such has the pace of change been since. I was disappointed to see the Underbelly Tank tank so quickly in the CBD & the Platform bar at Central become so homogenous, but have been very impressed with the Embassy since it opened last month. In keeping with each Craft beer bar in the city it has its own unique space & atmosphere but and is certainly a city bar you’d be happy to dwell in. Draught Sierra Nevada Torpedo has been my go to beer there recently, a drop priced surprisingly competitively too. My only concern is that despite its location, each time I’ve been in there’s never been more than about 7 or 8 other customers in at any time, although I’ve only kept evening visits to the middle of the week. I’ve tried a few times on Saturdays to go to the Grand Central Platform Bar and it’s been shut each time. Not sure if they’re just opening for the office worker crowd during the week.